Capital One has announced its sponsorship of University of Delaware Horn Entrepreneurship’s Diamond Challenge for the second year. “As an innovative company, Capital One truly represents what we’re teaching young people: to stay relevant, to innovate and to be an overall compassionate and active local and global citizen,” said Julie Frieswyk, manager of youth programs for Horn Entrepreneurship. 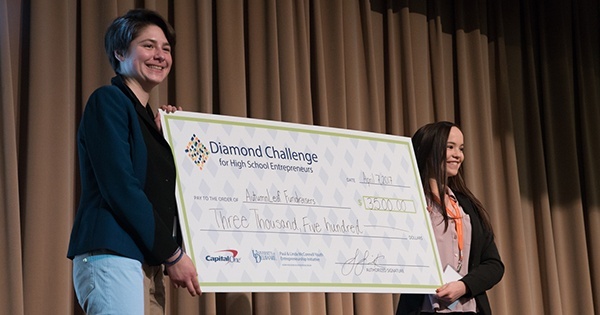 The Diamond Challenge is an entrepreneurship competition for high school students that offers participants a unique opportunity to learn more about entrepreneurship while putting their ideas into action. Participants write submissions for a business concept or social innovation as well as give a five-minute pitch to a panel of judges. Financial sponsorships are what help the Diamond Challenge move forward, enabling the creation of new content, as well as the ability to provide meaningful awards to participants, including the competition’s $100,000 prize pool. “We love working with Capital One. They support so many amazing initiatives in Delaware and we’re grateful to be one of them,” said Frieswyk. Since it’s foundation in 2012, the Diamond Challenge has reached more than 4,000 students from over 39 countries and 27 states. Last year, the competition was ranked one of the top 29 best international business plan competitions by Alpha Gamma, a business portal for millennials.